The Pro-Billet Ready-to-Run distributor is the perfect upgrade for outdated points distributors or bulky HEIs. Simply install the distributor in the engine, connect three wires to the coil and fire it up! A maintenance-free magnetic pick-up accurately triggers the module. The increased output of the amplifier easily outperforms stock ignitions and will smooth out the engines idle, improve starting and provide a much higher rpm range. The Ready-to-Run features MSD's adjustable mechanical advance which allows you to custom tailor an ignition curve to match your engine's needs. There is also a vacuum advance canister to help improve economy. For positive street performance, the Ready-to-Run is the best choice. 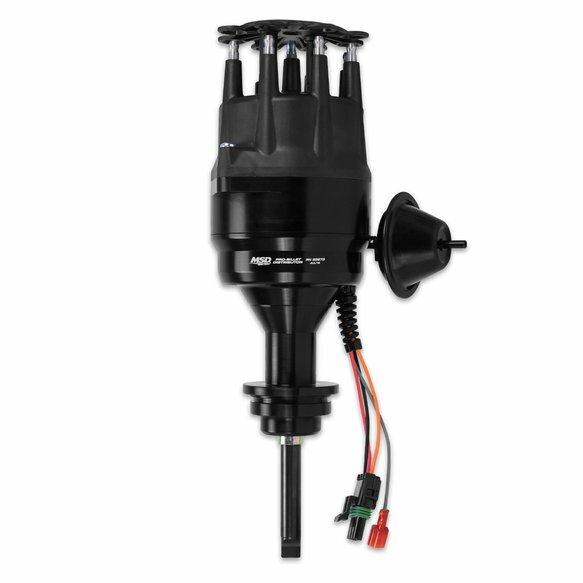 Includes a separate tach circuit that is ideal to trigger a tach or an aftermarket EFI such as an Atomic EFI system.